In the past three decades, the United States of America has witnessed a renaissance of craft brewing. Before Prohibition (1920-33), the US had around 1750 working breweries. In 1980, there were only 100. Then came the craft brewers. Today, the States has around 2,000 breweries, and I was determined to try as many craft beers as I could on a recent trip there. The ones listed here, in no particular order, are my favourites not only because they are all stellar beers but also because they, like all good beers, added a warm glow to reunions and get-togethers. The first time I drank Fat Tire was at a beer tasting organised by Alex Postelnek, an itinerant American brewmaster. Fat Tire is an amber ale made in the style of Belgian beers by the Colorado-based New Belgium Brewing Company. The New Belgium Brewing Company’s owner, Jeff Lebesch, named this beer in honour of a bicycle trip he had undertaken through Belgium. In Champaign, Illinois, where he resides, my brother Gautam hosts a weekly poker game and he was keen that I join in. The Fat Tire kept me company as I gambled through the night. According to the Colorado-based New Belgium Brewing Company, the Fat Tire “pairs well with people”. That’s exactly what it does. The sweet and malty ale got me through a mad night. Ever since I read Setting the Table, I had wanted to visit one of its author, Danny Meyer’s restaurants. Meyer is the founder of the New York-based Union Square Hospitality Group. Shake Shack, “a modern day roadside burger stand”, is among his many popular eateries. In fact, it is so popular that I had to queue up to get inside. After half an hour of waiting, I had a brimming glass of Brooklyn’s Shackmeister Ale in one hand and a couple of Shake Shack’s signature frozen desserts in the other. 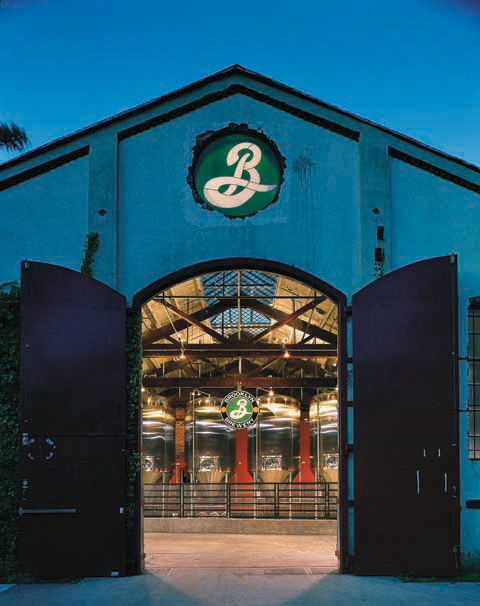 Brooklyn Breweries, founded in 1988, is one of New York’s iconic breweries, and the Shackmeister, a pale ale, is brewed specially for Shake Shack. The medium-bodied beer is biscuity and caramelly and displays an excellent balance between hops and malts. The kind of drink that you want to keep quaffing forever. We, my brother Gautam’s family and mine, travelled to Chicago from Urbana. The journey, my first experience of driving in America, was not a memorable one, thanks mainly to Gautam’s backseat driving. We were all hungry and stopped at the first restaurant we encountered at Chicago’s bustling Navy Pier, the family-friendly Bubba Gump. Bubba’s is famous for its shrimp, but I also needed beer. Drink local has always been my mantra, and, so, I ordered the Goose Island Summertime, from Chicago’s Goose Island brewery, to go with the shrimp. Unfortunately, the ale didn’t help me crack the Forrest Gump quiz, but my daughter won a nice tall Bubba Gump glass. American brewers use the change of season to introduce different brews, and the seasonal ale, a Kolsch beer brewed the way the Germans do it, is a light, fruity brew. I first heard of Sam Calagione, the somewhat eccentric founder of Dogfish Head, the iconic Delaware microbrewery, a few years ago and was curious enough about him to read his autobiography, Brewing Up a Business. Dogfish Head’s 60 Minute IPA featured in the menu of the bar at the Hyatt in Chicago, where we were staying. It’s called the 60 Minute because hops are added continuously to the boiling wort for an hour. Hop-heavy beers are all the rage in America, and Dogfish Head even has a 90 Minute and a 120 Minute IPA. The 60 Minute IPA was a perfectly nice, if slightly bitter, beer. One problem I have with hoppy beers, though, is that they are not, in beer industry jargon, “sessionable”. You can’t drink multiple beers of this kind in a short interval of time. The Grand Canyon makes an impression. If anyone tells you it’s just a large hole in the ground, slap him. My only regret is that we didn’t do the helicopter ride over it. My son went down with fever towards the evening, so we had to cancel our dinner plans and pick up some Big Macs instead. To go with our burgers, we chose the Sierra Nevada Pale Ale, and it was an excellent decision. The Pale Ale, California-based Sierra Nevada Brewing Co’s most popular beer, comes in a stubby bottle. The attractive green label depicts these two big bunches of hops, which conveys the impression that the beer could be on the bitter side. But, it’s not. The Pale Ale is also bottle-conditioned, which means that instead of artificially carbonating the beer, yeast is allowed to naturally carbonate it post-fermentation. In one word: crisp. I hooked up with my friend Benny Thomas en route San Ramon, and we went out for a seafood lunch (despite Benny being a seafood-hating Malayalee) in Santa Monica, where Benny lives and works. We settled in at a comfortable table at the Blue Plate Oysterette, which is located right on the bustling Santa Monica beachfront, and ordered some ceviche. There were a few interesting-sounding beers on tap, but I ordered the one I was vaguely familiar with: the Allagash White, from Maine. Benny echoed my decision. “Excellent choice,” said our waitress, though it’s entirely possible that it is her standard response to every beer ordered at the restaurant. The beer was so good I quickly ordered another one to go with our next dish, a lobster roll. The Allagash White tastes a lot like the Belgian wheat beer Hoegaarden, and, on further investigation, I found that the recipes of both beers are remarkably similar: they are both spiced with coriander and Curaçao orange peel. By the time I got back to our hotel, it was pretty late and nearly every member of my family was glaring at me. But, I was floating on an Allagash cloud and remained impervious to their displeasure. Amnesia IPA, made by the Indian Wells Brewing Company, was an interesting beer I encountered in Las Vegas. India Pale Ale (IPA), as the name suggests, traces its origins to India. During the Raj, the British needed a beer that could endure a six-month voyage from the breweries of England to the British garrisons in India. Some bright spark thought of a special formulation that would keep the beer fresh, and thus was born the India Pale Ale style of beer. The smooth, dry-hopped Amnesia was an excellent example of its tribe. Mexico doesn’t just send over tequila to the US; Americans drink a lot of Mexican beer, from the mild Corona to the unremarkable Dos E to the Modelo range. I got a chance to taste the NegraModelo, a Mexican dark beer brewed in the style of a Munich lager, at Chipotle, a Mexican quick service restaurant. The exotically-namedNegraModelo had always intrigued me and, finally, it was within my grasp. It had a hint of sweetness, a few bitter notes and perfectly matched the burritos I had ordered. We were in Central Park for an afternoon picnic with a bunch of friends. The sandwiches were from Le Pain Quotidien, and Vivek ‘Kacko’ Kaushal’s bountiful cooler supplied us with Blue Moon Summer Ale and Whale’s Tale Pale Ale. Blue Moon is a well-known brand, but it was Whale’s Tale, from Cisco Brewers, which I had never heard of before, that caught my fancy. I drank a couple of cans of the malty, slightly citrusy Whale’s Tale, switched to some Sauvignon Blanc and then drank another can, as I tucked into some homemade cupcakes. It was a lovely summer afternoon in New York. The hemlines were rising, and life was good.